That title does not deceive you as there really is an item of clothing that combines multiple levels of awesomeness. 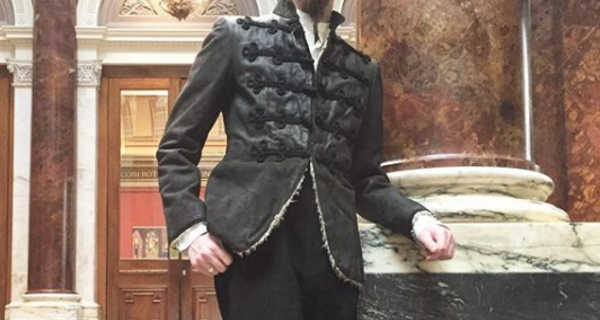 A black Victorian hussar uniform made in leather for the James Bond stuntman Richard Graydon in the 1975 film Royal Flash. The 36″ jacket (I am thrilled to have the body of a stuntman somehow) is made from a synthetic sheepskin with a both intentionally and unintentionally distressed outer skin. It fastens with hook and eye fastening as well as frogged toggles, only one of which looked to be coming loose. The fit is incredible – literally recreating a period uniform in the bold material. He repeated the cable-car feat fighting Jaws ten years later, standing in for Roger Moore. He eventually performed in 10 Bond films in total. Royal Flash was the 1975 adaption of George MacDonald Fraser’s book of the same name from the Flashman Papers series in which he featured alongside Malcolm McDowell of A Clockwork Orange fame and Oliver Reed.